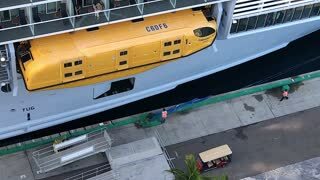 Rumble / Close Calls - Several passengers aboard the Norwegian Escape cruise ship were injured on Sunday 3 March when a sudden gust of wind made the ship list. 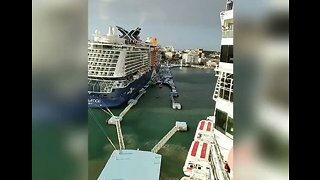 4300 passenger cruise ship was unpredicted rocked by an "extreme" 118 Mph wind gust off the mid-Atlantic coast on late night. Anthony Caramello captured these footages from inside the ship showing flying objects and injured passengers. 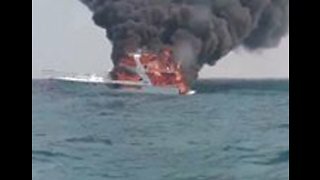 Norwegian Cruise Lines has confirmed, sending the massive ship into a dangerous list and injuring multiple passengers. The Norwegian Cruise Lines Escape set sail from New York City on Sunday afternoon on a 7 day round trip voyage to the Bahamas with a stop in Florida along the way. Just hours into its trip, the usual cacophony of chirping slot machines and clattering buffet trays was pierced by screams when a freak wind gust slammed into the ship&apos;s starboard side and tilted it at least 21 degrees. Social media posts from passengers describe everything from bruises and cuts to panic attacks and broken bones. 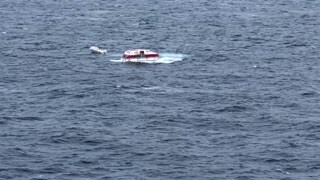 Everything in our room falling and sliding, I have never been so scared in my whole life," passenger Samantha Foster told Crew Center. "Even the cruise manager when we came on right after the tilting started, he could barely speak.and his voice was shaking. All the plates and glassware smashed on the floor. 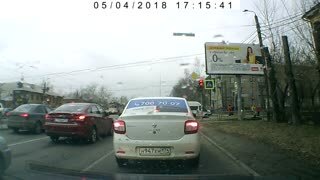 A lotto machine fell on a lady. A passenger writes on his tweet"My goodness, we heard all the noise and glass crash. Then from there, the boat started listing even more, and that is when the panic hit, we were looking for the life lifesavers and I was looking to jump out the aperture and jump on the nearest thing around." In a statement on Facebook, Norwegian Cruise Lines admit the incident and an unspecified number of injuries, but it said the ship itself was undamaged and will continue on its voyage as scheduled. The freak wind gust, rare but not unheard of, was reportedly spawned by the same powerful storm system that generated deadly tornado&apos;s in Alabama earlier that day. These super-sized vessels are slightly top-heavy, but not enough to actually capsize in a situation like this. In addition to having improved and computer-controlled ballast systems, the center of gravity is simply too low thanks to all the heavy mechanical machines lying at and below the waterline. Pictures of the aftermath show broken glass across the floor, as well as damaged furniture and chairs, were strewn across the ship.